Snow had been forecasted for this past Tuesday, December 3rd. I had watched the reports with increased anticipation, as I was very hopeful for a fresh clean slate of snow to track some cats in. Every day the chance for precipitation rose higher and it became clear that I would be hunting soon. What I was not excited about was the falling of the mercury into the single digits and then down into the dreaded negative marks. By last Wednesday night the temperature was -12° in my hunting area. My plan was to hunt Thursday morning with my Mother as my hunting partner. Despite the cold weather, we decided to continue with the hunt. The snow had ended and left nearly a foot of powder in the area. We arrived in the region at daybreak and immediately cut a fresh double set of bobcat tracks. Season for the smaller cats had just started five days prior. We decided to trail these cats and attempt to call them in for hopefully their last encounter with human beings. I also had in my thoughts that learning about a smaller relative of a mountain lion might help me call in the actual version. I have never set off to specifically call a bobcat and I knew I would learn a lot along the way. We bundled up in as many layers as possible and headed off in the snow wearing snowshoes. It turned out the snow shoes were not needed and became more cumbersome to wear than simply walking in the powder. Of course this was discovered only after several miles of walking. Following the bobcats was an adventure in itself. You could clearly see were they scratched, marked, and hunted their way along rock piles, brush, and pine stands. 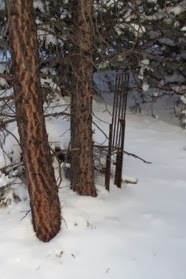 I have never seen bobcats hunt together before and had to confirm the prints and their gate several times to be sure I was not following coyotes. I can only assume this was a mated/mating pair or perhaps a mother and large kitten. After nearly a mile of following the tracks, they led up into a rocky peak of a hill. Partially circling around the bottom of the hill I found the tracks did not lead back out. I was certain the cats were in up in the rocks either in a den or hunting. We set up a call stand at the base of the hill and called for approximately 25 minutes. I would have liked to stay longer but the absolute cold would not permit it. Neither of the cats appeared and in the interest of preventing hypothermia or frost bite with moved on. 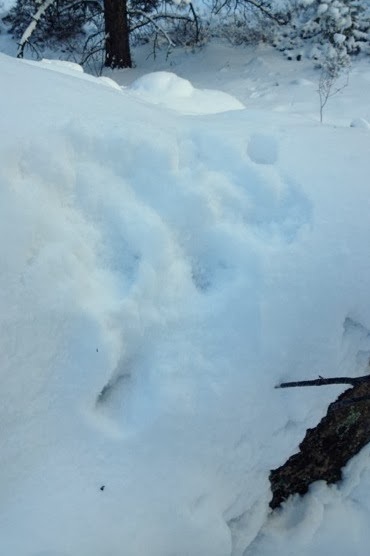 We completed a circle of the hill and found the cats were still in up in the rocks, they had just decided to not come in or had and we missed it. It is also possible that we made too much noise getting into position and the bobcats were spooked long before we made the call stand. After losing to the bobcats we decided to head to the relative warmth of the truck. The hike back through the snow and rocky hills was tiring and cumbersome. It would have been much better to backtrack our way out, rather than continuing the loop to the road that the GPS showed was faster and closer. Along the way we crossed paths with a cow moose. It was a wonderful and unexpected sight. Back at the truck was continued our road running journey to discover Lion prints. As we drove we discussed the bobcat hike and what we would do different next time. The central theme was to only go a short distance on the tracks, and then attempt to call the bobcat back to us, rather than trying to get close and then call. The drive turned up many other animal tracks and additional sighting of Moose. By 3:00pm, no Lion tracks had yet been found. We crossed a set of fairly fresh bobcat tracks and decided to implement our new bobcat tactic. We again layered up and headed up the tracks. Following the little cat we discovered he was a smart kitty. His tracks led to a trappers live box trap. The cat stopped short of the trap, backtracked and then headed up hill. We followed him up and set up a stand in a very small clearing that allowed the cat plenty of cover to approach the rabbit decoy that was approximately 25 feet in front of our location. 10 minutes into the call stand my Mother nudged me and whispered she had caught movement at the top of the clearing. We both moved into a better shooting position and waited. Unfortunately, nothing came in or moved again for the duration of the call stand. We stopped again a little earlier than normal due to the extreme cold. Before leaving the stand we walked to the top of the clearing and found the bobcat had come into the call. Right where my mom had seen something run were prints. The bobcat had come back in following his own set of the prints from earlier in the day. He had jumped onto a rock and perched there watching the decoy for a space of time before leaving. It was depressing; the rock he hid on was not in view for either my mother or I, but in view of the decoy. What a missed opportunity on this cat. I have always heard mixed theories on using decoys on cats. There is a feeling that seeing the decoy will cause the cat to stop rather than bring it in, theory proved. After losing to bobcats for the second time in one day we continued our fruitless search for a lion track until darkness forced our return to civilization. 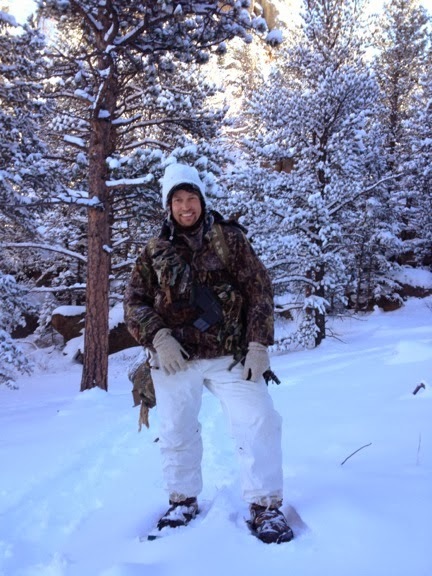 I learned a great amount about bobcats, and tracking in fresh light powder. Chasing the little cat for a day was a good distraction from lions. The lessons they taught me will be applied to their bigger cousins. I am looking forward to another day out cat hunting soon, albeit hopefully in somewhat warmer weather.